The most amazing thing happened while I was photographing this flatbread; my 17 year old son said “Mom that looks amazing – so summery”. What? My 17 year old paid me a compliment? That just made my day. I do agree with him. 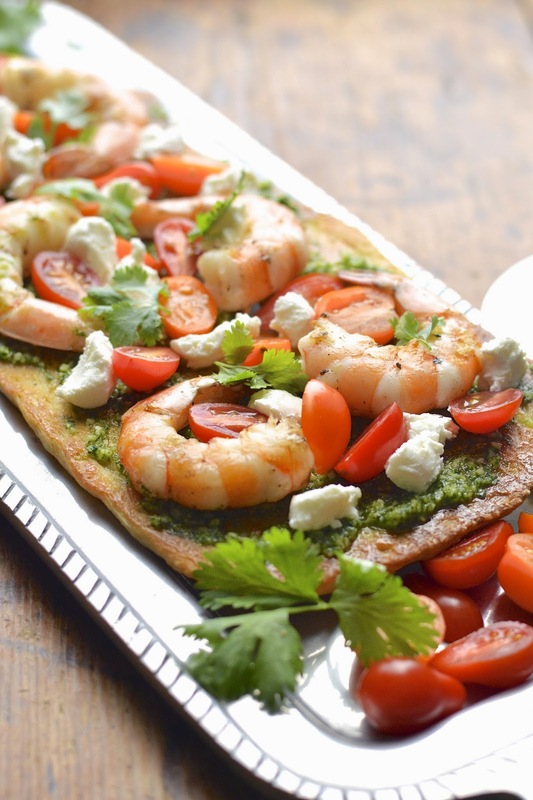 This flatbread with grilled shrimp and cilantro pesto is super summery. It’s light, crunchy and herbaceous. Organic cherry tomatoes along with goat cheese help create a beautiful and tasty lunch or dinner. I’m not sure if you have ever had cilantro pesto before, but you really have to try it. Cilantro is my second favorite herb after basil, and when you prepare it as a pesto it really brings out it’s fresh and unique flavors. 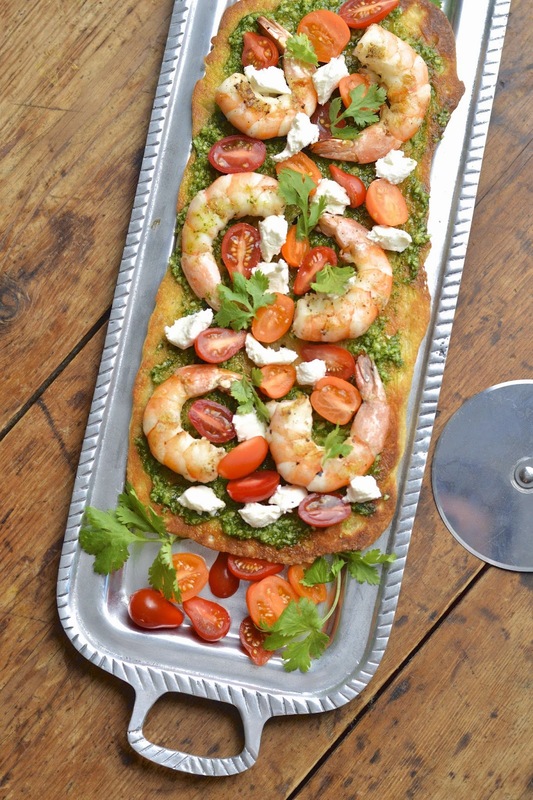 This pesto lends beautifully to the goat cheese and shrimp, which is lightly grilled with just a hint of salt and pepper. 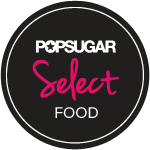 Although each flavor in this flatbread can stand alone, together they are superb. Preheat oven to 425 degrees F. Shape each piece of the dough into rectangular shaped crusts and place on a baking sheet coated with olive oil. Lightly brush the top of crust with olive oil. 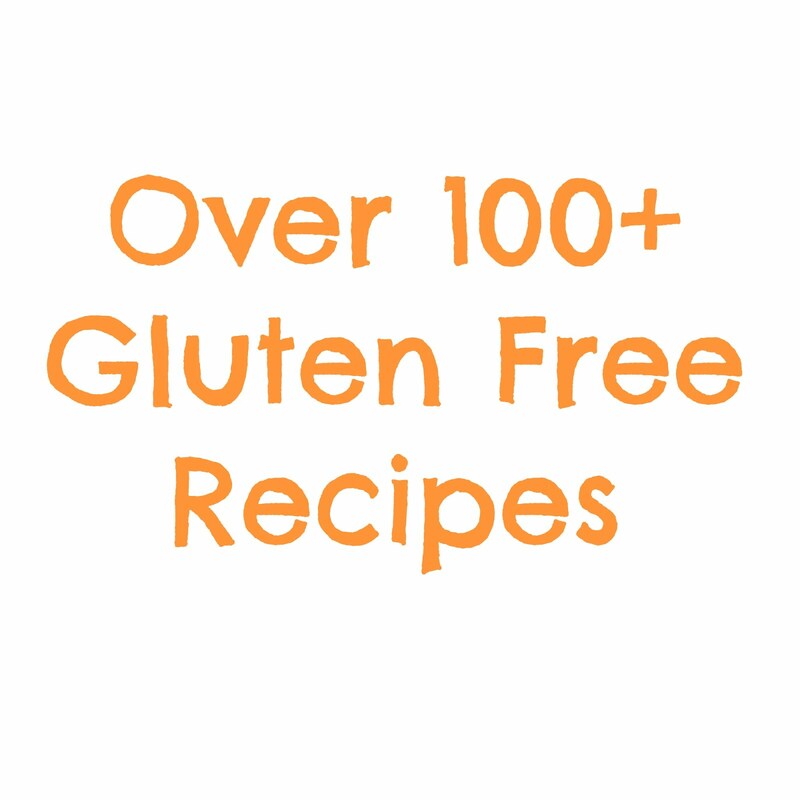 Bake for 15 to 20 minutes or until lightly browned. Remove from oven and set aside. In the meantime, place all of the pesto ingredients in the bowl of a food processor, and blend until smooth. Preheat your grill too 400 degrees F. In a medium bowl toss the shrimp with about a teaspoon of olive oil, 1/2 teaspoon of kosher salt and freshly ground pepper to taste. Place shrimp on grill and cook on each side for about 2 minutes or until shrimp is opaque in the center. 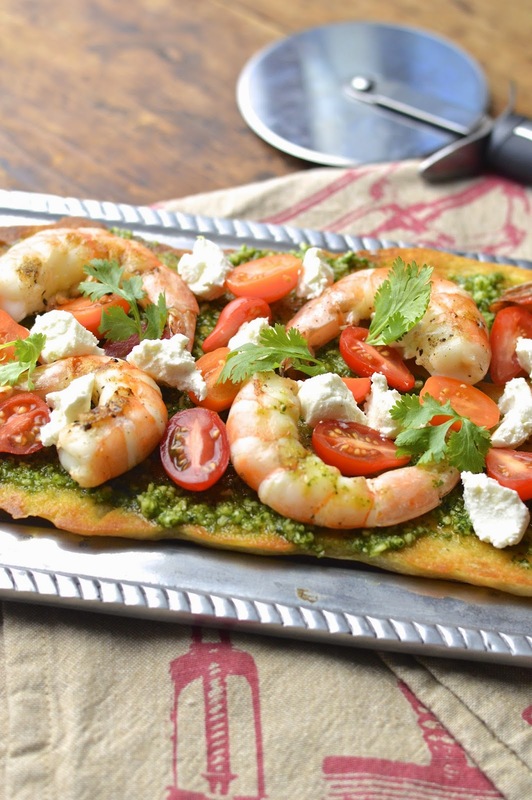 Spread desired amount of cilantro pesto on each flatbread. Top evenly with shrimp and cherry tomatoes. Crumble goat and spread evenly on top of each bread. Garnish with fresh cilantro leaves. Serve room temperature.